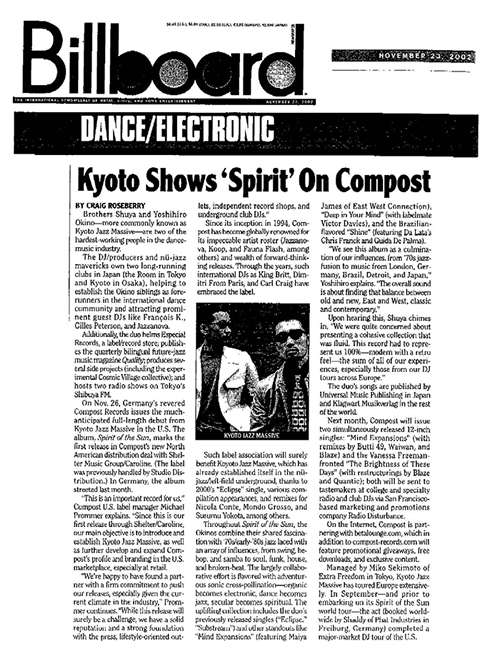 Since brothers Shuya and Yoshi Okino formed KYOTO JAZZ MASSIVE (named by DJ Giles Peterson) as a DJ unit in the beginning of the 90's, they have pioneered the way for Japanese Club Jazz/Crossover music at home and abroad. Shuya Okino is also the owner of The Room club, Shibuya, one of the most vital venues worldwide in supporting Club Jazz/Crossover music, while Yoshi Okino runs the influential shop and record label Especial Records. In 1994 their first production was released, a compilation CD entitled "KYOTO JAZZ MASSIVE V.A.". Their first single "ECLIPSE" was released in 2000 after signing to the record label 'COMPOST' (Germany). In 2002 KJM released their first album "SPIRIT OF THE SUN" which received global acclaim. The 'BY KJM/FOR KJM/RE KJM' series was released as a Kyoto Jazz Massive Tenth Anniversary project in 2004. 'Kyoto Jazz Massive Live Set' featuring Vanessa Freeman and Tasita D'Mour was also formed in 2004 and have gone on to perform all over Europe and Asia. 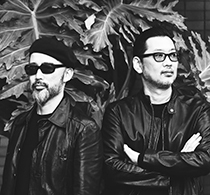 Some of the events 'Kyoto Jazz Massive Live Set' have played include Tokyo Crossover Jazz Festival (Japan), Rising Sun Rock Festival (Japan), North Sea Jazz Festival (The Netherlands), Balton Sound Festival (Hungary). As DJ's they play regularly not only in Japan but all over the world including the U.K, Germany, Italy, France and the U.S.A.
Shuya Okino has also established his name as a writer, authoring three successful books 'What makes a good DJ', 'The First Book of Club Jazz.' and the business book 'Filter Your Thinking for Success'. During Shuya Okino's career he has produced a number of successful artists including Mondo Grosso, Sleep Walker, Cosmic Village, Hajime Yoshizawa, ROOT SOUL and DJ KAWASAKI. He has also released his debut solo album 'United Legends' in 2006, featuring 'Thank You' which was nominated for Best Song in Giles Peterson's 'Worldwide Awards'. Currently Shuya Okino is preparing for his latest solo album's release, 'Destiny. 'Destiny' features Navasha Daya, N'Dea Davenport, Clara Hill, Divinity and Pete Simpson providing vocals for one cover and one original song. The first single 'Still In Love' featuring Navasha Daya has already been picked up by numerous DJs around the world, Giles Peterson for BBC Radio One, Kevin Beadle, Patrick Forge amongst many others. 'Still In Love' is also scheduled for release in the UK from the record label 'Defected'. MAKE IT BETTER (KYOTO JAZZ MASSIVE REMIX) / U.F.O.